PayInvoice: First Stable Release is Live ! Today marks the first official, stable release for PayInvoice. Many thanks to all the people who helped test and shared ideas to bring together a stable release, this would not have been possible without all the support and feedback from the community. Our team is very proud of the work that has gone into the PayInvoice Core, and we consider this handout as a great step towards introducing the native invoicing features to Joomla websites. PayInvoice allows you to build strong, reliable system for managing all your Invoicing needs and help grow your profits by collecting revenue for what you sale on your Joomla site. You may also get a slight feel and the vision of our team while developing PayInvoice in our earlier Alpha release blog. So, what's new with this release ? In comparison to our last beta release we achieved many new code commits the result of which stands as new features in this installment. Let us have a look at those here. Information compilation at the Dashboard - As foretold in the alpha release blog we have added this pinch of usefulness to further ease the invoice management at your end. 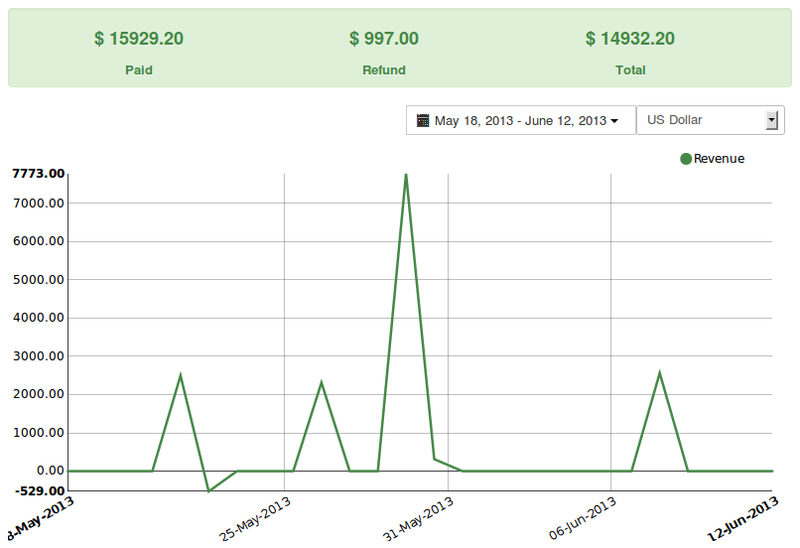 The dashboard will serve as a faithful analytics for all the actions of the invoices charged by you. The Dashboard will allow you to track and show a colorful Graphical interface for the status of your income via Invoices. 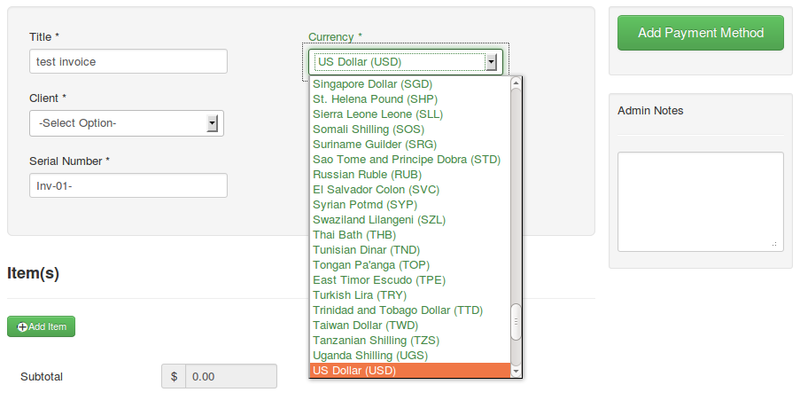 Multiple Currency Support - PayInvoice stable release supports all the standard currencies round the world. The above image shows a glimpse of the few currencies supported by PayInvoice. Further the dashboard has the ability to track the analytics for each and every currency individually, tagging the growth of your business worldwide. Export Functionality - Now just at your whim PayInvoice will be able to create a PDF copy of the invoices created by you just for the ease of printing and accounting practices. Quick refund will be possible - It has always been our primary motive behind everything we do; accomplish faith for us in our users and because of which we believe that if reasons are genuine a refund should never be delayed. With this theme in our mind we developed this concept into PayInvoice. If the Payment gateways support an external refund PayInvoice will handle it efficiently and securely. You will need not to go beyond and work further. So, currently this quick refund scenario is possible in Authorize Cim & Stripe only. Paypal and Paypal Pro also support refund, but they need to refund from Paypal's merchant account. As discussed earlier we have arrived at two pricing models. Freemium - As the name suggests product is freely downloadable and unlimited usage is be allowed for unlimited time. Individuals who will choose to go with this model will be freely allowed to use only Stripe Payment gateway integration with PayInvoice. Official Support - $29 $18 USD per month for Payinvoice and its all subscribed apps, for single domain. Apps/ Payment Gateways - Each app is available for purchase individually. You may pick your choice and have a look at the pricings on the Official PayInvoice page. Once purchased updates will be available for 6 months. Friends, I would like to clear again, that we are an Open Source company and all our products follow GNU/GPL licensing. So, PayInvoice and all its apps are usable till the end of time Ã¢ËÂºonce purchased but updates will only be available during the subscription tenure. App Manager - We will be adding this feature with intentions to help you out and even save your precious time purchasing various apps. All the applications that will support and expand the workflow of PayInvoice will be hosted at the App Manager and it will be usable as a section in the PayInvoice. It will allow you a quick preview of all the free as well as paid apps available, with a little description just like an app market. CSV data exporting - Currently PayInvoice supports the export in only .PDF format, but it will be enhanced further with .CSV export. It will impart the power to export invoices in an editable format for further references. Recurring Invoices - Including this feature is still in consideration depending solely on the needs of our users. It will allow PayInvoiceÃ¢â¬â¢s user to automate the repetitive billing processes to their fixed clients. So, there will be no more forgetting and only timely payments.